Parker 45 Harlequin in the Grey Shield design from 1979-84. Cartridge/converter filler in brushed steel with a cut out shield pattern. Extra Fine steel nib. Near mint condition. Working very well with the included converter. 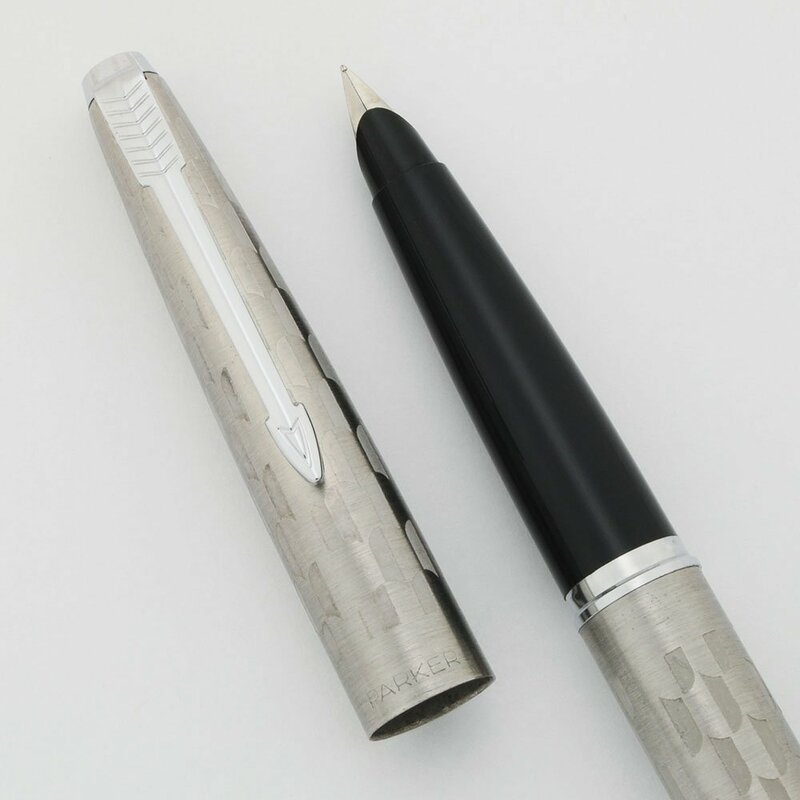 Product Name Parker 45 Harlequin, it seems "harlequin" meant repeating diamond pattern but Parker incorrectly took it to mean any repeating pattern. The pattern on this pen is repeating circlets. This was also called the Parker 80. Filling System Fountain pen takes Parker cartridges, or you can fill it with bottled ink via the included squeeze converter. Color Brushed stainless steel with cut out circlets. It is called "Grey Shield" because the non-steel part is gray. It has a dimpled tassie which was used in the 1970s. Nib EXTRA FINE steel nib . The collar is labeled, "X". Condition Near mint condition for this shiny, glinty pen. The section has some light marks, probably from capping the pen. The cap, tassie, clip and trim look great. No cracks, dents, or personalization.